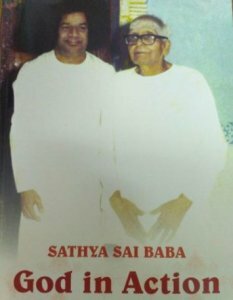 "Sathya Sai baba - God In Action" A compilation of talks delivered by Sri N Kasturi to groups of Overseas devotees, In Prasanthi Nilayam, brings to you, our dear readers, the formal and intimate talks by Prof. N. Kasturi, full of erudition and insight, laced with humour, which have unfolded facets of Baba's unfathomable divinity that are not commonly known. Sri N Kasturi Spiritual talks cover a wide range of spiritual topics, such as 'Real Nearness', 'From Unreality to Reality', ' The Divine phenomenon', ' The True Gruu', ' Purpose of the Avatar', and 'Five Steps to Self- Realisation', with the intention of guiding devotees in their spiritual practices and thereby, paving the way for their spiritual uplift in their life's sojourn. There are many wonderful incidents in this book, which we have not read anywhere. Every incident in this book tells us how Bhagawan came to the resuce of people at large and put them on the path of Sadhana. This book will surely be a source of bliss to all, who are blessed to read it.